“When asked if my cup is half-full or half-empty my only response is that I am thankful I have a cup.”– Sam Lefkowitz. Let's show gratitude and be thankful for the countless blessings we often take for granted. 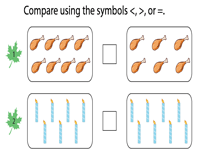 Celebrate this emotional holiday with our worksheets that comprise math and literacy activities such as identifying the common and proper nouns, distinguishing between statements and questions, plugging in the missing numbers, finding part-to-part ratios to mention a few. Ask the question - "What's this?". Once the kids recognize the pictures, teach them how to spell the words associated with Thanksgiving Day. Enrich the vocabulary and spelling of kids in the process. 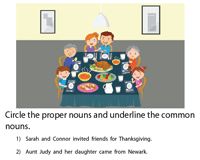 Familiarize kids with proper and common nouns giving adequate examples. 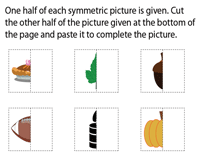 Follow-up with this Thanksgiving worksheet to identify them. Keep your tissues ready as the sentences will leave you drooling! Let's go back in history and learn about the Pilgrims who landed in America. Read each sentence carefully and figure out the sentence type. Kids learn to differentiate between questions and statements. The turkeys are ready with numbers on their feathers. 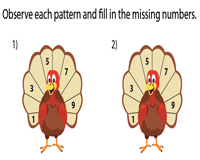 Rattle your brains to identify the pattern in each of the turkeys. Skip count accordingly and plug in the numbers to complete the pattern. Don't forget to make a wish with our wishbones as you count the pictures and compare them in this worksheet. Ensure the kids count the pictures accurately and plug in the appropriate comparison operators. Count the two different sets of objects in each of the problems given. 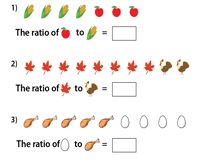 Analyze the quantitative relationship between the two sets and write the part-to-part ratio to complete this Thanksgiving Day worksheet PDF. The pies, the pumpkins and the apples are all cut in halves. Look for their other halves in the pictures given below. 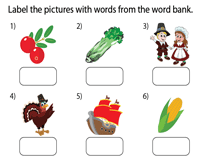 Snip the picture cards and glue them to complete the pictures in this worksheet.